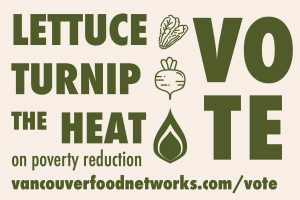 We are pleased to present this campaign, Lettuce Turnip the Heat on Poverty Reduction – Vote! alongside the BC Poverty Reduction Coalition’s Poverty Free BC Action Week. For the campaign, we have developed a fact sheet for each day, with some copy, to be shared on social media. Please see below for the schedule and content to be shared! It would be amazing to have as many networks as possible sharing these.